Aquavitae is an archaic name for a concentrated ethanol or aqueous solution. During the Middle ages liquors were distilled and used through the lands of ancient Rome. The term means "all types of distillates". Virginia colonists distilled liquors for their own use and stored it inside of butts, hogsheads and runlets. A good quantity of peach and apple brandy was also manufactured. The wealthier colonists preferred sack and aquavitae to beer and ale. 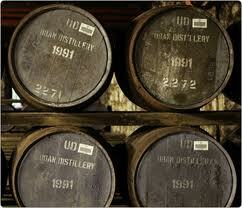 In time, madeira became the most famous form of spirits and was in use during meals. Punch was manufactured from the West Indies using rum or apple or brandy.